Nato chief Anders Fogh Rasmussen has said Americans should set aside any doubts about the commitment of other Nato members to the war in Afghanistan. In his first speech in the US as secretary-general, Mr Rasmussen said the campaign in Afghanistan was one of necessity, not choice. The speech comes after the top US and Nato commander in Afghanistan warned of likely failure without more troops. But rising casualty figures have hit public support for the operation. Mr Rasmussen pointed out that 40% of the Nato troops involved in the operation were from non-US countries and that soldiers from more than 20 countries had been killed. Shoring up the coalition is what this visit is all about, says the BBC's Paul Adams in Washington, and with that end in mind, Mr Rasmussen carefully avoided taking sides in the American troop debate. He didn't say, and it is not clear, whether he thinks additional troops are the answer, our correspondent notes. Mr Rasmussen is due to meet President Barack Obama on Tuesday. "I'm a little concerned about the doubts I hear these days in the United States about Nato," Mr Rasmussen said in an address to the Atlantic Council think-tank. "Talking down the European and Canadian contributions - as some here in the US do, on occasion - can become a self-fulfilling prophecy." He said he was aware of frustrations among US officials caused by "the restrictions some Nato nations put on their forces; by the time it takes Nato to reach decisions; by the reluctance of some countries to send more forces to the mission, even for training. "Let me be very clear. I understand those frustrations. I am already working hard to address those very real problems," he went on. 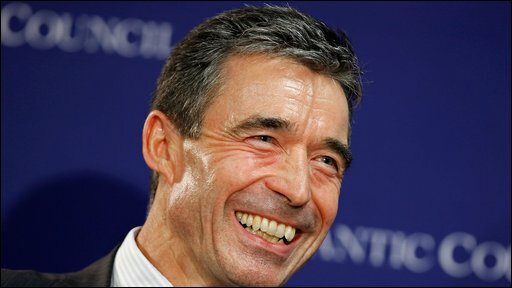 Mr Rasmussen highlighted Nato's casualties in the campaign. "While body count is no measure of solidarity, it is, unfortunately, a symbol of commitment. Over 20 countries have had their soldiers killed, some in large numbers," he said. "I will not accept from anyone the argument that Europeans and Canadians are not paying the price for success in Afghanistan. They are." He added: "If we are to succeed in Afghanistan, it will only be if we do it together." Mr Rasmussen also says the training programme for Afghan forces needs to be stepped up. "If Afghan security forces are to take the lead, they will need to be better trained, better equipped and likely more numerous, which means we are all going to have to invest more in training and equipping them." 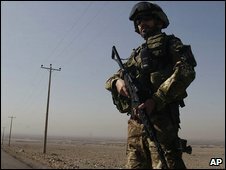 There are currently some 100,000 foreign soldiers in Afghanistan from more than 40 countries - more than 60,000 of them American. Despite the request for more troops by military commander Gen Stanley McChrystal, US President Barack Obama says he will not decide until after a strategy review. Correspondents say European countries are not expected to offer any significant increase in troops unless Washington takes the lead. The Netherlands and Canada have already set 2010 and 2011 as deadlines for withdrawal and Italy has announced plans for a "strong reduction" in its forces.